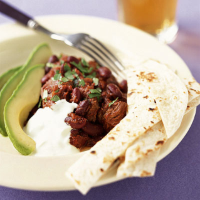 This variation of chilli con carne has slow-cooked cubes of beef rather than mince, and the unusual addition of cocoa powder, to balance the spices. Heat the oil in a large flameproof casserole with a lid, or a large frying pan. Add the beef in batches and cook for 2-3 minutes, until lightly browned. Return all the meat to the casserole or pan and add the onion, cooking for 2-3 minutes, until the onion is slightly softened. Stir in the chilli powder, tomatoes, oregano and cocoa powder and season to taste. If you have been using a pan to fry the beef, transfer to a casserole. Cover and bring to the boil then reduce the heat and simmer for 1½ hours, stirring occasionally. Stir in the beans, cover and simmer for a further 30 minutes, or until the beef is tender. Uncover the casserole for the last 15 minutes of cooking. For a thicker sauce, continue cooking to reduce further. Stir in the coriander, reserving a little for a garnish. Just before serving, heat a large, dry frying pan until hot, then lightly toast the tortillas for 1-2 minutes on each side. Cool slightly, then cut into strips. Garnish the chilli with the remaining coriander, and serve with the warm tortilla strips, slices of avocado and the soured cream. Try making the chilli 1-2 days in advance and storing in the fridge, as this enhances the flavour. Reheat thoroughly in a pan over a medium heat until piping hot.